How many countries did I say I had visited after my last trip? However many it was, it wasn't a patch on the 217 mentioned in the excellent 500th edition of British Airways Highlife magazine by a Graham Hughes. He's younger than me, visited four times as many countries as me in one - okay, extended visit alone - but I'm not envious. Just taken note and, well, maybe found another which I can add to my list. And I found all this out aboard a British Airways flight to Miami with my Irish friends, Mary Magee and Pat Monaghan, the other two Green Peas. ( Numbers One and Two: I regret that I am still bringing up the rear...) One country which I can definitely add to my list is now Peru as this was the trip on which we were embarking courtesy of a circuitous route - blame me - which had us spending a night in Heathrow, Miami and Lima before arriving in Arequipa pretty much four days after Mary and Pat's first flight from Dublin. It was, though, a lovely way of breaking the journey several times and as gentle a way of getting there as possible. From this, as we feel, august group of Green Pea travellers, I alone was visiting South America for the first time but none of us had been to Peru before. And well packed also having managed to pack more than my two female companions combined... I was made an honorary woman (Irish). We met at the Heathrow Central Travelodge. I, being the last to arrive, was told by the helpful receptionist that a guest was waiting for me in the restaurant. I'd hoped for two actually which threw her slightly but both had made it mercifully. We were off at 6.45 am the next morning for the flight to Miami which threatened to be on time but was ultimately late but did make up most of the time. It's not usual that I find or say that a longhaul flight in Economy is very good but this one was especially so. I had managed to book a seat with legroom and, as it happened all the Green Peas were dotted about the plane as we all wanted aisle seats. One of my colleagues found it odd when I mentioned it before I left the office - Mary had sent a message saying don't change it! - but we had no inclination of falling out just as we set out. The meal was excellent, the cabin crew helpful and friendly and indeed my only concern was people watching me play a song which I enjoyed and kept on enjoying. And further enjoying. I made a 10% dent into The Lord of the Rings: my third such attempt since the age of thirteen and not once have I yet finished it. It's the sense of adventure and travelling which I love about it. I hate to admit that Mary and I both made mistakes with our ESTAs months ago putting that we were in transit. I didn't even think about it but Mary alerted me to the fact. We were, in airline parlance, in transit but nonetheless leaving the airport and it took two emails - which were not replied to - and a call to the Border Control to establish that we would be okay. As it happened, the chap who saw us in Miami was terrific: no trouble whatsoever and he was welcoming, friendly and fun. 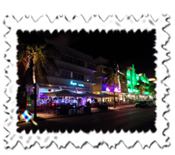 The first drama of the trip came at the Penguin Hotel on the delightful Miami South Beach. We had booked rooms in February but a computer problem was blamed for an extended wait to get into them. Mary and Pat were taken to a room which turned out to be completely barren but for some workers' tools but thereafter a twin-bedded room couldn't be found and, after a long wait, they were forced to accept a room with a sofa bed added. I was asked if I would like to pay an extra $20 to upgrade my room but declined and was given the room anyway. It turned out to take up the entire top floor of the hotel! 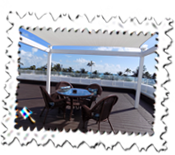 The room itself, whose rack rate is $600 a night before tax apparently, is simple but it is the remarkable terrace outside with splendid views of Ocean Drive and the beach which obviously bump up the price. But what views. I enjoyed them immensely. A resort fee of $19 is charged per room but, unbeknown to me, it includes a continental breakfast and two drinks between 5pm and 7pm so I got in just in time and enjoyed the local beer on my terrace. Ocean drive is busy for sure but fun and we enjoyed walking up and down it and along the beach before making our way back to the airport for the onward flight to Lima. Whoops, the honorary woman had to re-pack and be bailed out by the other women as my bag had too much in it. One heavy coat - which, the day before had been greeted by an incredulous barman as " Gee, buddy, where the hell have you come in from? " - had to be tied around my waist to save a charge of over $100 for the excess luggage. I'd like to say that the American Airlines flight to Lima was as good as the previous day's British Airways one but it wasn't. For a five and a half hour flight, there is not remotely enough space for tall people so I was up and down. The days of flying without television screens in the back of seats was, I mistakenly thought, over and there was some doubt whether drinks were included. They did include certain ones, the meal wasn't bad and it arrived pretty much on time after a fair time stuck on the tarmac so it served its purpose but, well, I have had more enjoyable flights. We were met by a chap from the Mundo Alberque Aeropuerto hotel who quickly had us into our rooms. He was quite an amusing individual and, with limitations on how we could converse, it was quite interesting at times. He enjoyed saying "non comprendo" and I found myself having a fitful night's sleep and waking up with the words non comprendo on my mind. He was back in the morning to take us back to the airport for our onward flight to Arequipa. 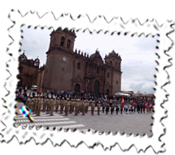 Maybe I shouldn't admit to this but Pat and I had both quoted our passport numbers incorrectly at the time of making a booking for Cusco to Lima and we were told that we must pay $6 each to correct it at Lima Airport on arrival. It was easily done but a lesson learned. The LAN flight to Arequipa was fine and the descent into Arequipa quite spectacular. I should at this stage like to thank my aunt and uncle, Jen and Chris Pratt, for showing me their excellent video of their trip to Peru two years ago. They did a similar trip to us - well, that sounds a cheek as we got our ideas from them! 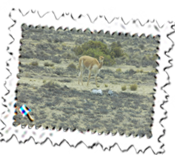 - but what I mean to say is that their advice was invaluable because they started off in Arequipa to acclimatise and we were very happy to do the same. At around 2325 meters, Arequipa is an ideal place to start off before the higher places. 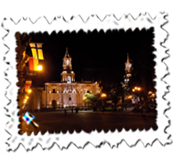 It was also a very beautiful place and the main square, Plaza de Armas, a common name it seems in Peruvian cities, was a treat with, on clear days, views of snow-capped mountains behind the cathedral. I ate overlooking the Plaza de Armas at night and it was a stunning view. The food, trout and alpaca, was also excellent at a reasonable rate given the surroundings and it was memorable. Mary joined me on the second night and I was glad as her Spanish is decent and made up for my futile gestures accompanied with a dictionary... Oh God, though, female folk enjoy shopping and yet again I found it an eye-opener watching what the womenfolk had bought whilst I, trying to become less frugal, still found it impossible to take on anything other than getting a guide to what to expect to pay. 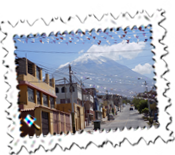 One mistake was to go for a walk - remember that we went to Arequipa to acclimatise - which, after the usual dramas of getting lost, turned out to be for four and a quarter hours. The sun was out too and I suffered slightly for my carelessness. It was a wonderful walk, though, seeing the mountains, the main one being Misti, and the city again. I thought that I would enjoy Arequipa and it turned out to be as good as I had expected. As it turned out, we were the only ones going from Arequipa so had a minibus to ourselves which took us through the wonderful Canyon country to an intermediate bus where we met the main bus at an intermediate point. During the minibus ride we saw a , well, condor, baby condor, falcon, hawk, call it what you please but it allows me to say that, in this barren land, it was flying where eagles dare... Lunch was included as were en route stops including, for me, the highest point I have ever been to at a lake called Lagunillas at 4413 meters or around 14,450 feet. 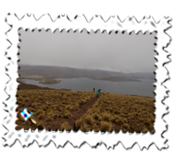 I felt obliged to feel a bit wobbly there and Puno, at least at that stage, held few fears at around 3,810 meters. 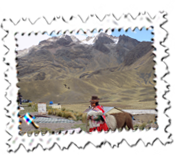 We arrived safely and the Hotel Arequipa which we had booked kindly met us and took us to their hotel free of charge. We had a meal opposite but Mary's mantra of eating lightly and avoiding alcohol at altitude passed me by. The most expensive steak - my God, did I really write that? Had I got used to the prices? - and a glass of red wine and, yes, I felt better for it. There was fun afterwards as quite a few of us were locked out - I had noticed that Peruvian hotels kept their doors locked and entrance was only by ringing the bell - and no-one could be found. One enterprising chap tried to effect entrance with a kitchen knife and didn't remotely mind me filming this event. When we did get in, we noticed the sign advising action in the event of an earthquake. 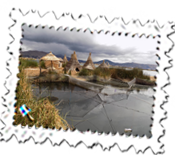 Our reason for visiting Puno was, like most visitors, for Lake Titicaca which is the highest lake in the world at around 12,600 feet. 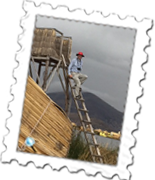 People make day tours, some go for shopping on the islands and some, like us, stay with a family on one of the Uros floating islands. 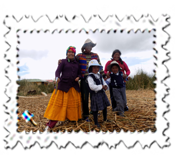 I had stumbled upon the Uros Turpirmarka website and Mary and Pat gladly agreed to come. Unfortunately, they both suffered during the night so we came back fairly quickly the following day but it was quite a novel experience. Some say that Lake Titicaca is for tourists. Maybe but, at the very least, it was something different and I was pleased for going and not just because I was, in general, fine and had a voracious appetite for the local trout for the evening meal. I was taken up to the watch tower which had nice views over the floating islands but was slightly alarmed when a quicker tourist boat went past and shook our island a bit. Stone cold sober, I did initially doubt myself... We were unable to go out fishing and reed-shearing because of Pat and Mary's indisposition but the adventure wasn't over when our boat ground to a halt on the return journey, an errant reed entangling itself in the motor. We were overtaken by the boat taking the children to school, much to their amusement. ( They didn't offer us a lift in our hour of need either!) Anyway, we were quickly on our way and back in the Hotel Arequipa where they kindly provided rooms. I must make an observation about the Spanish spoken in Peru. Admittedly, I know little but easily picked up the important words - which I used ad nauseam - and shopkeepers and I enjoyed some friendly and comical exchanges with lots of hand-waving and calculators coming out. But I hope that I know that the letter c is pronounced as th: not so in Peru, it seems. Okay, I am thinking of the word for thank you, gracias. We all laughed at the Basil Fawlty complaint about Manuel being unable to understand Basil’s Spanish: " I learnt classical Spanish not the strange dialect he seems to have picked up" but, in all seriousness, they do say gracias and not grathias. Another important word for me and not one to be taken on after a skinful, cerveza or beer, is a bit of a tongue-twister and I wasn't always understood when pronouncing it thervetha. Anyway, I enjoyed my exchanges but accept that I have a way to go. Oh God, we were warned about a fiesta taking place near the hotel in Puno that evening but never did we expect it to go on until 4.15 am and deafen everyone. The walls shook and sleep was quite impossible made worse that we had to be up at 5.45 am. In desperation, I packed and went downstairs remembering that we had been allowed to leave our cases in a store room which contained a bed. The bed was occupied so that ended that avenue of exploration... When we did leave, the hotel gave us a discount for hardship! It was very nice of them but hardly their issue. We had booked on to the tourist coach, Inka Express, to take us to Cusco and it was a lovely day and journey with a lunch and sightseeing stops. 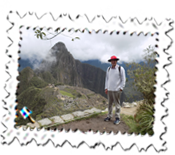 There was plenty of room showing up the frugality of airlines and we saw churches, walked across a rickety bridge, stopped at a high point in the mountains at 4,334 metres and eventually reached Cusco ten and a half hours after leaving Puno. 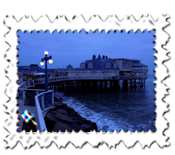 It was a wonderful way of seeing more of the country and very worthwhile and enjoyable. We put up in the Posada Inka Manco Capac Hotel in Cusco and, like all hotels which we stayed in, the people were not only very friendly but helpful. The owner's son, Christian, spoke excellent English and helped us in many ways. 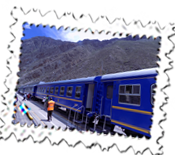 We had missed the small print on the PeruRail ticket saying that only 4kgs of luggage was allowed and this was pointed out to us by Christian which led to a quick change of plan. As we weren't sure that we could leave our luggage at the railway station at Ollantaytambo and didn't really feel comfortable asking the Posada Inka if they would keep our luggage as we weren't returning there, we established that we could cancel our Tuesday night booking at another Cusco hotel and re-book into the Posada Inka who booked us in again and kept our luggage. Everyone was happy. 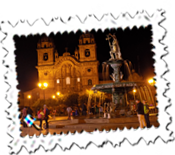 Cusco is also a nice place dominated really by its Plaza de Armas, a large square dominated by two churches, large fountain and many shops and restaurants. I was lucky the next day to see a large procession in the square and the weather, in this generally rainy season, was fine. During the stay, I managed to get rid of the aches and pains by having a £6 hour massage which made me feel a lot better and lose 50 soles on an exchange rate which irritated me beyond belief for such a small amount of money in the big scheme of things. I had counted it, found it correct so must have lost it somehow on the way back. The journey went through beautiful scenery and reminded me of the Visp to Zermatt journey in Switzerland but on a larger if not necessarily grander scale. Both are impressive. 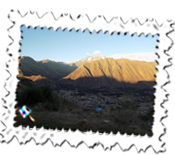 Aguas Calientes or Machu Pichu Pueblo, the town below the famous Inka settlement, is like an Indian hill station: sprawling, busy and a little chaotic but not without some charm and lots of souvenir shops. I settled on some slippers for my mum. Restaurants galore touted for your custom and we had a decent meal with a Pisco Sour included - not the first for me ( nor the last) but the first for Mary and Pat and, if photos were anything to go by, they seemed well-received. We stayed in the Hostal Las Americas which was fine and convenient but accommodation in general costs more here than in other places. On one of the biggest days of our travelling lives, guess who, after sleeping reasonably for most of the holiday yet was waiting to get up comparatively early, was woken by the alarm and held the others up? I had to rush a bit and we were on our way at 8 am by bus through an interesting road up to the Inka citadel. I had feared that, after hearing so much about it, I might oddly feel disappointed when I really saw it. Mercifully, this was far from being the case and, if anything, I was even more impressed as it was bigger than I had anticipated and the landscape much higher also than I had believed.We had a fine day also and the only slight regrets were leaving when the weather was even better and only seeing a llama and alpaca at long distance. So much of the walls and temples are comparatively intact and it is barely credible how so much stone could be transported to the area. The bus took twenty minutes so heaven knows how they made it given the vastness of the area. The official ticketing website always receives a bad press: only Visa cards are taken as payment and rarely does it work. Well, I can only say that my attempt was smoother than expected and worked. Okay, it took a couple of emails and doing it in Spanish but it was far less painful than I had thought and naturally saved on the inflated fees of agencies. 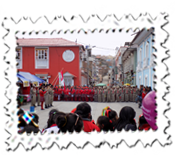 We returned to Aguas Calientes and probably only appreciated the occasion the following day. Okay, they allow 2500 people in every day so lots of people have "been there, done that" but we were honoured to have made it. Back in the town, I had recalled a joke we had had on seeing signs threatening action on drunks only to witness some drunken imbecile, bottle in hand, sitting on the track and holding the train up. One trusts that he had seen the last of beer for that day when the police arrived. Our journey back to Cusco was by collectivo or shared minibus and cost just 10 Soles ( around £2). After a meal, we checked in again at the Posada Inka at 9 pm and were on our way the next morning around 7.15 am. 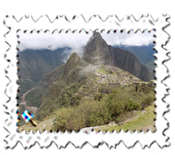 For whatever reason, I had checked our StarPeru itineraries two days previously and found, to my horror, that we had paid our $6 to correct a passport error abut had also been re-booked on an earlier flight without being told. I can't make it out at all and, whilst it wasn't inconvenient, I was glad that a sixth sense alerted me to it. I would expect anyone making a flight change to check their new itinerary but not when the airline has charged you for what amounted to an administrative error. All was well, though. Cusco Airport, which can suffer through poor weather which causes delays, was absolutely fine for us and the airport was very quick and easy to get through. 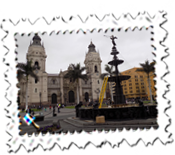 StarPeru were fine in the air and, our last port of call on this trip, the capital, Lima, was reached on time. We hired a taxi through one of the official companies, Taxi Green, and were quickly at the El Reducto which was another friendly place. The taxi ride was exciting: traffic, in general, is dense and chaotic, drivers have little or no regard for indicators, other road users and pedestrians and our experience was like the occasion when I was taken around Silverstone in a sports car... Anyway, never once did I feel bothered - I rarely do - and the driver agreed to pick us up the following day and was as good as his word. It was worth his while but his fare was indeed fair. I have to say that Lima will not linger in my memory but the Miraflores area set on cliffs above the sea, reminded me of Bournemouth and is pleasant. We shopped and even I entered into the spirit of it by buying a very nice jumper. I got it down to the price I wanted but, naturally after having to think it over and over and over, I returned too late that evening and too early the following morning to buy it. When I did return, the girl expected the Peruvian greeting with one kiss which probably meant that she was thinking "here comes that sucker who's paying far too much..." Anyway, she also gave me an alcoholic drink so maybe I am being unreasonable on my bargaining skills. 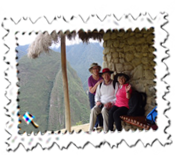 Our last day in Peru saw us take a Limavision city tour which was good. The traffic meant that we spent a lot of time in jams and maybe I would have liked longer in the very impressive main square which houses the cathedral and President's home. The tour took in an archaeological museum and the Monastery of St Francisco including the catacombs the contents of which are always slightly at risk from the threat of earthquakes. 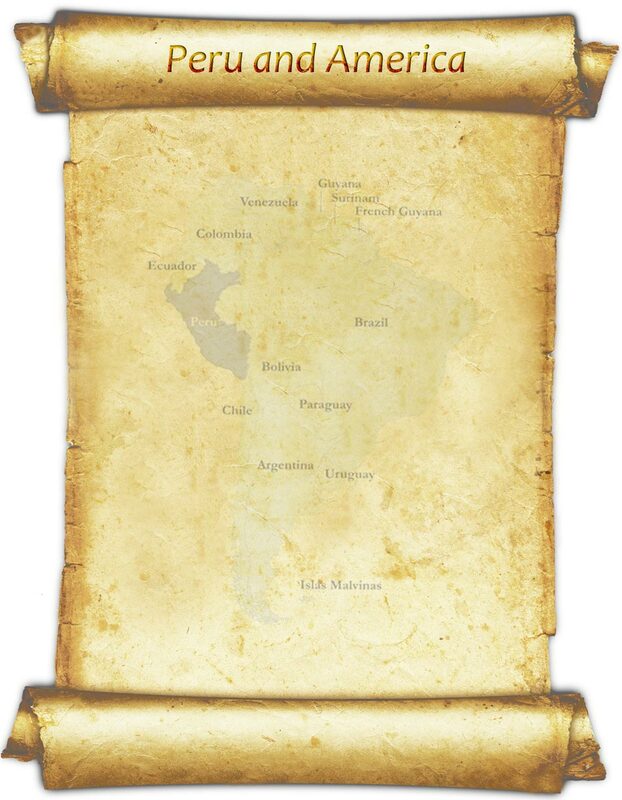 The last one, though, in Peru was in 2007 and, in Lima, 1975. We flew early the following morning to Dallas and I was pleased and grateful to get an exit row seat which don't seem to be released for online check-in twenty-four hours before. They wanted over £100 for this and, frankly, I feel that tall people suffer in this area but, hey ho, it's a business. Other airlines are better but I was grateful to the lady at American Airlines. The flight was therefore fine and we reached Dallas on time around 7.30 am and were collected by the Wingate by Wyndham Las Colinas which turned out to have the best rooms of the whole trip. 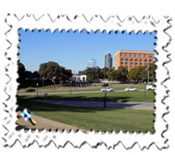 The reason for going to Dallas was to see the Sixth Floor Museum, the excellent place within the former Texas Book Depository where Lee Harvey Oswald allegedly shot and killed John F. Kennedy. We had also booked a tour for the following morning - the day before the fifty-second anniversary of his assassination - showing the day's tragic events and we went in on the first day to find our meeting point. Having seen photos of the events of that November day in 1963, the place seemed almost familiar. There hasn't been much development and, barring the many tourists and people making a living through, one trusts, historical expertise, it still nonetheless comes over as a fairly peaceful area although it will naturally be remembered for the barbaric acts which ended the life of one of America's most charismatic and younger presidents. I had a good look around but may have been responsible for us leaving the DART train service one stop early and missing our bus back to the hotel. We had a bit of a palaver returning. Our tour through JFK History Tour the next day was very interesting and lasted around one and three quarters hours. It might have been better had we been able to stop at some of the sites such as Oswald's Rooming House - now a museum - and the Parkland hospital. Using radio coverage of the day, the tour was well done and we had been told by the company to book our tickets at half the normal price through Amazon Local and then exchange them via email with JFK History Tour. 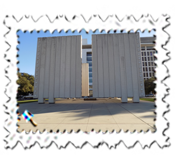 I went into the excellent museum which has archived footage of the day's deadly events, a history of Kennedy and his family and audio tapes are provided within the cost. The Sniper's Perch is preserved but not available for entry but, if Oswald was the assassin, I found myself surprised that, with two views of the motorcade, he should choose the more difficult angle when, before turning into Elm Street, he would have had a far more direct view in front of him. Anyway, theories abound but neither the tour nor the museum seek to influence visitors and leave it up to them to make their own minds up. There is an excellent bookshop and I can highly recommend both the tour and the museum. Our flight back that evening was a bit fraught. Busy, no chance of a better seat and Pat and Mary had to wait until an hour before for their seat numbers. Their chances of making the flight didn't seem high to me despite seeing that five people were on standby although their names were not amongst those. Anyway, they did make it but it was a long flight and a bit of an endurance test but we made it. They flew onto Dublin whilst I took the Heathrow Express back to Paddington. Three times... Oh dear, I remember hearing a message calling someone to collect their bag left on the platform and thinking silly sod. It was me and, after a cold sweat when I realised, I must say how excellent the staff were in making arrangements for me to collect the stray bag and return to Heathrow free of charge. Their good humour and politeness at my carelessness was much appreciated and I made sure that I wrote to their employers to pass on my thanks.